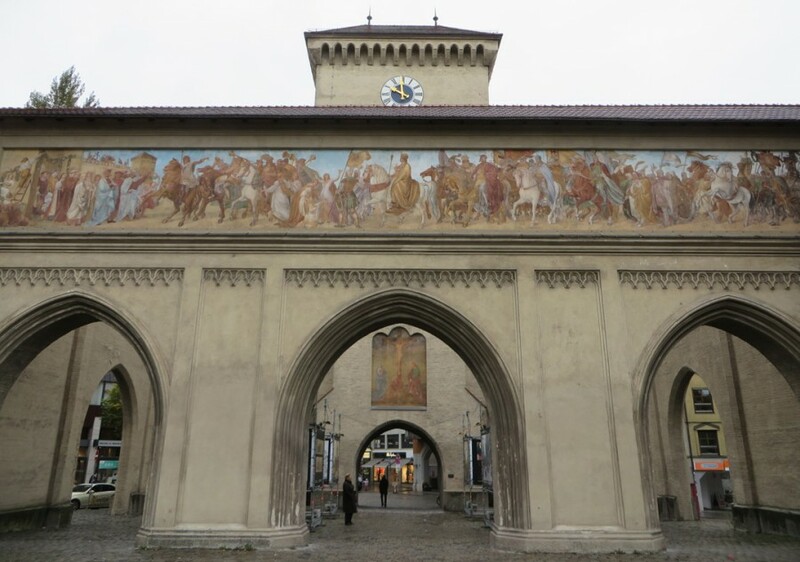 On Thursday, October 20 (2016), we went to the Frankfurt train station and bought our tickets to Munich. We didn't want to pay for the super-fast train, so we went with slightly less expensive tickets for a slower ride. That also meant we had to spend a while hanging out in the train station waiting for the train to arrive, so we picked up some breakfast snacks at the shops there. One of the items we sampled was Frankfurt's local specialty, apple wine, which was sold in a huge bottle that was more than enough for all three of us. The train ride lasted several hours, and then our hotel was a substantial distance from the main station (not to mention difficult to locate in a side alley), so it was getting dark by the time we checked in and dropped off our luggage. The weather had also turned quite chilly, getting down near freezing. Our hotel was about two blocks from the scenic city center, so we went for a quick look around. 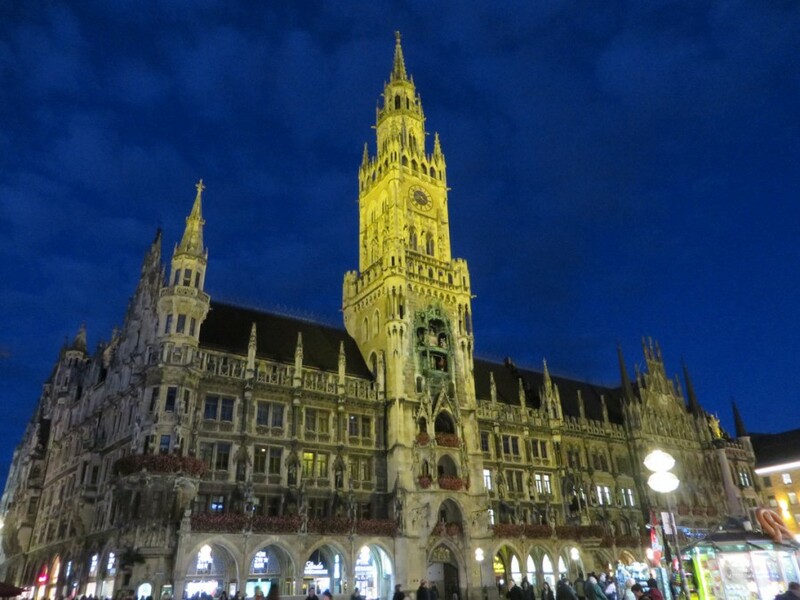 The lit buildings were impressive even at night, particularly the famous glockenspiel. As lunchtime approached, we started looking for a place to stop and eat. 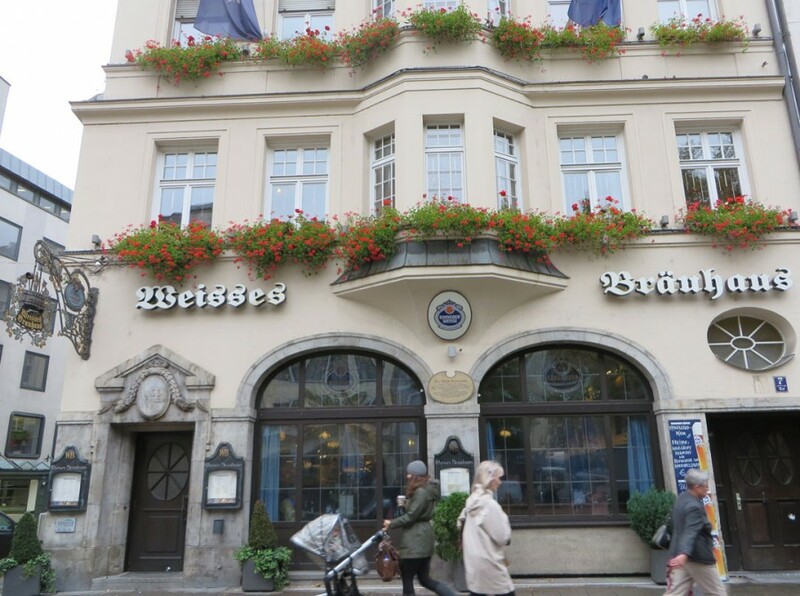 We walked into the famous Hofbrauhaus, but the place was not only packed without a single open seat, there was a constant line of people walking through searching for spots. We merged into the river of people and walked around the raucous interior, but not only was there no chance we'd get to sit anywhere, the atmosphere itself was too loud and boisterous for our taste. 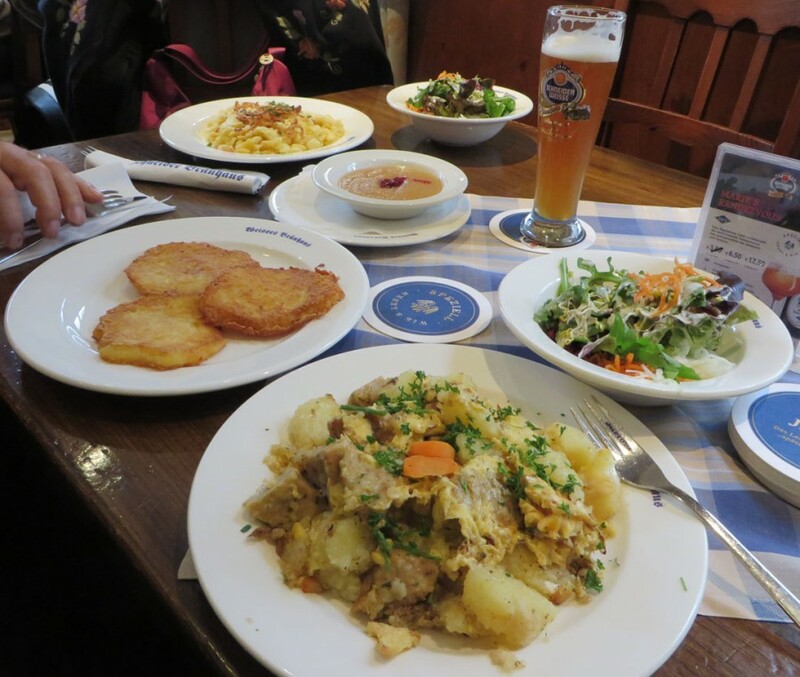 We left quickly and found another brauhaus that was more accommodating, where we sampled their traditional potato pancakes with applesauce and various other offerings. 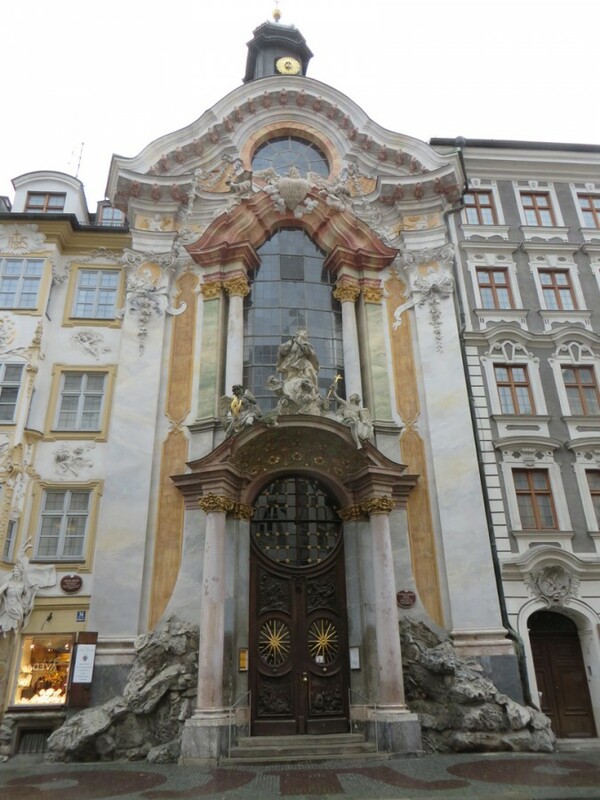 After lunch, we watched the glockenspiel show, then we spent about two hours shopping for dirndls. 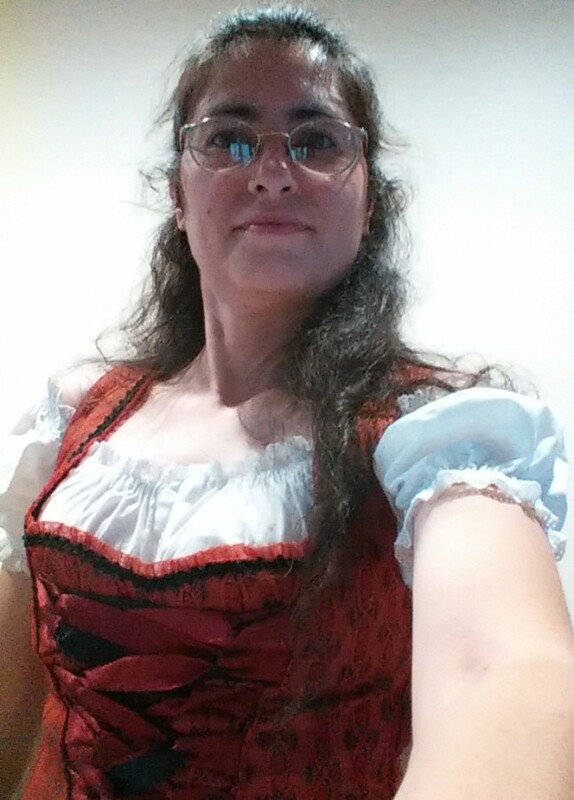 megory bought a complete outfit, while I picked up a two-piece dirndl-inspired top that can be worn with jeans for a nice casual-festive touch. After shopping the various touristy places, we ended the evening by buying some roasted chestnuts at a street stall. The heat of the chestnuts was quite welcome, as the temperature remained frosty. We returned to our hotel, gobbled up our brauhaus leftovers for supper, and got all our belongings packed up for travel. In the morning we checked out and dragged everything back to a train station, where we got tickets to take us to the airport. That's where I split up with my parents, as they were traveling back to Michigan via Air Canada (which ended up being a nightmare flight with delays and a stop in the wrong city), while I was getting on a British Airlines flight with a stop at Heathrow on my way back to California. I made the most of my time in the airports, spending as much of my remaining European money as I could on food and trinkets. And that concludes my 2016 European vacation trip report! It also concludes my series of entries on LiveJournal. I will continue all further updates using my Dreamwidth account.